The impact and authority of Oliver’s letters can be measured by several factors. First, “there is no evidence that Joseph Smith assigned Cowdery to write the letters.”6 Second, the Prophet gave some support by providing Oliver details about “the time and place of [his] birth” and information about his adolescence that would help Oliver correct anti-Mormon misconceptions as a main concern,7 but it is unclear how much information Joseph supplied about other things. Besides these errors, Oliver includes lengthy quotations of the angel Moroni to Joseph Smith which are unlikely to be a verbatim recapturing.18 Given that this depiction of Moroni’s interviews with Joseph between 1823–1827 was published some years after their occurrence, and given the fact Oliver was not present during these visits, it is more likely that, true to his extravagant literary style, Oliver somewhat embellished his account to enhance its readability and appeal.19 This is not to say Oliver’s letters should be dismissed wholesale, only that they should be used carefully in historical reconstructions. It is therefore more appropriate that, rather than seeing Oliver’s views on the topic of Book of Mormon geography as being authoritative, prophetic pronouncements, they should be seen as reflections of, if not the main cause behind, popular nineteenth-century Mormon speculation on Book of Mormon geography. While it is clear that Joseph said he was visited by the angel Moroni on the west side of the unnamed hill near his family’s Manchester, N.Y., home,27 that is a separate matter from how far and wide Moroni had wandered during the 36 or more years after the final battle in A.D. 385 before he deposited the plates in A.D. 421 in their designated resting place. So, Oliver’s Messenger and Advocate letters need to be approached cautiously. Although they are not entirely free from error and embellishment, they are, of course, quite valuable to students of early Mormon history. They provide many important insights into the translation of the Book of Mormon and the restoration of the priesthood, matters with which Oliver was personally acquainted. Most of all, these letters are intended to be read and used for increasing faith in the gospel of Jesus Christ and in affirming belief in the Book of Mormon as the word of God. Roger Nicholson, “The Cowdery Conundrum: Oliver’s Aborted Attempt to Describe Joseph Smith’s First Vision in 1834 and 1835,”Interpreter: A Journal of Mormon Scripture 8 (2014): 27–44. Book of Mormon Central, “Where Did the Book of Mormon Happen?,” KnoWhy 431 (May 8, 2018). 1. J. Leroy Caldwell, “Messenger and Advocate,” in Encyclopedia of Mormonism, ed. Daniel H. Ludlow (New York, NY: Macmillan, 1992), 2:892. 2. The letters can be read online at the Book of Mormon Central archive. 3. “Letter II,” Latter Day Saints’ Messenger and Advocate 1, no. 2 (November 1834): 27–28. In October of the same year that Oliver began his letters, the anti-Mormon author E. D. Howe published his highly influential work Mormonism Unvailed [sic] in nearby Painesville, Ohio. In it, Howe attempted to prove that the Book of Mormon was a modern fabrication based on a manuscript written by a certain Solomon Spalding and that Joseph Smith’s reputation, including his honesty and moral character, was suspect. Howe’s book can be accessed online at https://archive.org/details/mormonismunvaile00howe. Unlike other anti-Mormon writers, like Alexander Campbell, whom Oliver also responded to elsewhere in the Messenger and Advocate, Howe was never mentioned by name in any of Oliver’s letters to Phelps. Nevertheless, the timing of the publication of Howe’s book, the considerable influence it wielded in popular discourse on Mormonism, and the overall content and focus of Oliver’s letters all make it seem very likely that Oliver was at the very least indirectly responding to Howe. On Oliver’s efforts to defend the Church, see generally John W. Welch, “Oliver Cowdery’s 1835 Response to Alexander Campbell's 1831 ‘Delusions’,” in Oliver Cowdery: Scribe, Elder, Witness, ed. John W. Welch and Larry E. Morris (Provo, UT: Neal A. Maxwell Institute for Religious Scholarship, 2006), 221–239; John W. Welch, “Oliver Cowdery as Editor, Defender, and Justice of the Peace in Kirtland,” in Days Never to Be Forgotten: Oliver Cowdery, ed. Alexander L. Baugh (Provo, UT: Religious Studies Center, Brigham Young University, 2009), 267–270. 4. See “History, circa Summer 1832,” online. 5. One year earlier, the Church’s newspaper The Evening and the Morning Star ran editorials by William Phelps on the content and message of the Book of Mormon and the early progress of Mormon missionary efforts, but these articles provided neither a substantive history behind the early life of Joseph Smith nor a clear narrative describing the coming forth of the Book of Mormon. See “The Book of Mormon,” The Evening and the Morning Star 1, no. 8 (January 1833): 56–58; “Rise and Progress of the Church of Christ,” The Evening and the Morning Star 1, no. 11 (April 1833): 83–84. On the importance of Oliver’s letters as an early Church history, see Richard Bushman, “Oliver’s Joseph,” in Days Never to Be Forgotten, 6–10.” Phelps, “The Book of Mormon,” 57, appears to be the first recorded instance of the hill in New York where Joseph Smith received the plates being called Cumorah. 7. Joseph Smith letter to Oliver Cowdery, “Brother O. Cowdery,” Latter Day Saints’ Messenger and Advocate 1, no. 3 (December 1834): 40. It seems very likely that Joseph provided his support in an effort to counter the accusations made in Howe’s Mormonism Unvailed. Additionally, it seems that that Oliver had access to Joseph’s 1832 history and incorporated elements of it in his sketch of Joseph Smith’s early life. See the discussion in “JS Defended Himself in Letter in Messenger and Advocate,” online; Roger Nicholson, The Cowdery Conundrum: Oliver’s Aborted Attempt to Describe Joseph Smith’s First Vision in 1834 and 1835,” Interpreter: A Journal of Mormon Scripture 8 (2014): 27–44. 9. Pages 46–103 of the 1834–1836 history are written in the hands of these scribes. The history can be accessed online. 10. Republications of Oliver’s letters began appearing in 1840 when Parley P. Pratt reprinted Oliver’s depiction of the visitation of Moroni to Joseph Smith. See “A Remarkable Vision,” The Latter-day Saints’ Millennial Star 1, no. 2 (June 1840): 42–44; “A Remarkable Vision,” The Latter-day Saints’ Millennial Star 1, no. 5 (September 1840): 105–109; “A Remarkable Vision,” The Latter-day Saints’ Millennial Star 1, no. 6 (October 1840): 150–154; “A Remarkable Vision,” The Latter-day Saints’ Millennial Star 1, no. 7 (November 1840): 174–178. The letters were further republished in 1840 (“Copy of a Letter written by O. Cowdery,” Times and Seasons 2, no. 1 [November 1, 1840]: 199–201; “Letter II,” Times and Seasons 2, no. 2 [November 15, 1840]: 208–212; “Letter III,” Times and Seasons 2, no. 3 [December 1, 1840]: 224–225; “Letter IV,” Times and Seasons 2, no. 4 [December 15, 1840]: 240–242; Orson Pratt, A[n] Interesting Account of Several Remarkable Visions [Edinburgh: Ballantyne and Hughes, 1840], 8–12), 1841 (“Letter VI,” Times and Seasons 2, no. 11 [April 1, 1841]: 359–363; “Rise of the Church,” Times and Seasons 2, no. 12 [April 15, 1841]: 376–379; “Letter VIII,” Times and Seasons 2, no. 13 [May 1, 1841]: 390–396; “O. Cowdery’s Letters to W. W. Phelps,” Gospel Reflector 1, no. 6 [March 15, 1841]; 137–176), 1843 (“O. Cowdery’s First Letter to W. W. Phelps,” The Latter-day Saints' Millennial Star 3, no. 9 [January 1843]: 152–154), and 1844 (Letters by Oliver Cowdery, to W.W. Phelps on the Origin of the Book of Mormon and the Rise of the Church of Jesus Christ of Latter-day Saints [Liverpool: Ward and Cairns, 1844]; “O. Cowdery’s Letters to W. W. Phelps,” The Prophet 1, no. 7 [June 29, 1844]). 11. “Letter III,” Latter Day Saints’ Messenger and Advocate 1, no. 3 (December 1834): 42–43. 12. Joseph’s journal entry on November 9, 1835, which was copied by Warren Cowdery into the 1834–1836 history project, clearly recounted the 1820 vision in which Joseph saw and heard two beings. See Dean C. Jessee, “The Earliest Accounts of Joseph Smith’s First Vision,” in Opening the Heavens: Accounts of Divine Manifestation, 1820–1844, ed. John W. Welch, 2nd ed. (Provo: Brigham Young University Press, 2017), 9–12. For a recent attempt at making sense of Oliver’s omission of the 1820 vision, see Nicholson, “The Cowdery Conundrum,” 27–44. 13. Bushman, “Oliver’s Joseph,” 6. 18. See “Letter VIII,” Latter Day Saints’ Messenger and Advocate 2, no. 1 (October 1835): 197–198, where Oliver quotes Moroni for an astounding 1078 words. 19. Oliver’s overwrought verbosity, his penchant for “rhetorical flourishes” which make “the story more Oliver’s than Joseph’s,” his telltale “flowery journalese,” and his ”florid romantic language“ have been noted by careful readers. See for instance the remarks of Bushman, “Oliver’s Joseph,” 7; Arthur Henry King, The Abundance of the Heart (Salt Lake City, UT: Bookcraft, 1986), 204; Davidson et al., eds., The Joseph Smith Papers: Histories, Volume 1, 38. 20. “Last Days of Oliver Cowdery,” Deseret News (April 13, 1859)” 48. 21. See Scott H. Faulring, “The Return of Oliver Cowdery,” in Oliver Cowdery, 321–362. 22. Oliver makes his views plain in “Letter VII,” Latter Day Saints’ Messenger and Advocate 1, no. 10 (July 1835): 155–159. 23. As made clear in Joseph Smith’s December 1834 letter cited above, the extent of the Prophet’s involvement with the compositions of the Messenger and Advocate letters was to provide Oliver with information about his youth and upbringing. In the absence of any corroborative evidence attesting to Joseph’s input beyond this, any comments made by Oliver in these letters concerning the geography of the Book of Mormon must therefore have been his alone. 24. "On August 17, 1835, in the midst of the Saints’ attempts to petition the government for help, Oliver Cowdery and Sidney Rigdon presented a document titled 'Declaration of Government and Law' to Church members in Kirtland, Ohio. The declaration—now Doctrine and Covenants 134—sought to address all of the Saints’ concerns." Spencer W. McBride, "Of Governments and Laws," online at history.lds.org. 25. An excerpt from Letter I providing Oliver Cowdery's firsthand testimony of the translation of the Book of Mormon and the visitation of John the Baptist was included in the 1851 Pearl of Great Price as a footnote to republished portions of Joseph Smith's 1838 history. The Pearl of Great Price was canonized as scripture in 1880. This excerpt is present in the current 2013 edition of the Pearl of Great Price (Joseph Smith—History 1:71 footnote). Beyond this footnote reproducing part of Letter I, no material from the letters has been canonized, including any material from Letter VII concerning the location of the hill Cumorah. 26. “Church leadership officially and consistently distances itself from issues regarding Book of Mormon geography.” John E. Clark, “Book of Mormon Geography,” in Encyclopedia of Mormonism, 1:176. See also Book of Mormon Central, “Where Did the Book of Mormon Happen?” KnoWhy 431 (May 8, 2018). 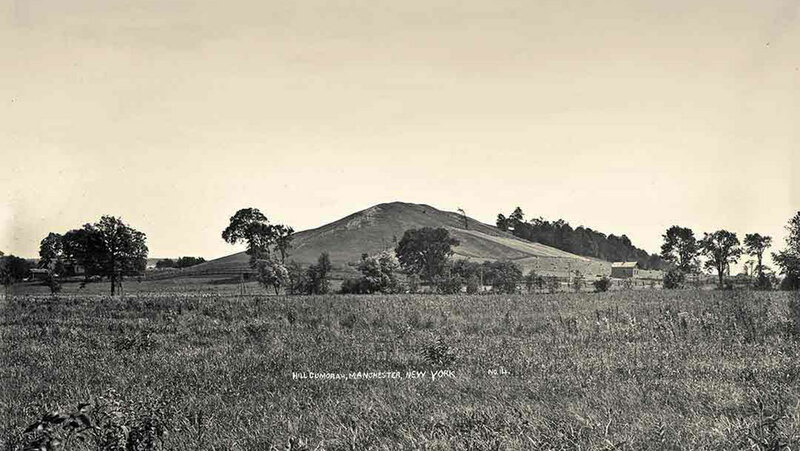 While a number of later Church leaders felt confident in following Oliver in identifying the hill Cumorah as the hill in New York, others, such as apostle and later Church president Harold B. Lee, demurred. “Some say the Hill Cumorah was in southern Mexico (and someone pushed it down still farther) and not in western New York. Well, if the Lord wanted us to know where it was, or where Zarahemla was, he’d have given us latitude and longitude, don’t you think?” For the Lee citation, and additional citations showing some variance amongst Church leaders on the issue of the location of the hill Cumorah, see FairMormon’s collection of Hill Cumorah Quotes. 27. Joseph Smith himself appeared somewhat ambivalent towards the location of the hill Cumorah. In Joseph’s earliest history the “place . . . where the plates [were] deposited” goes unnamed. History, circa Summer 1832, p. 4. In his 1838 history the Prophet again merely describes the location where he found the plates as “a hill of considerable size” without positively identifying it as Cumorah. History, 1838–1856, volume A-1 [23 December 1805–30 August 1834], addendum, p. 7. Also in 1838, while describing how he obtained the Book of Mormon, Joseph spoke generally of "a hill in Manchester, Ontario County New York" as the repository of the plates, again without identifying it as Cumorah. Joseph Smith, Elders' Journal (July 1838): 43. Some 4 years later, however, in a letter dated 6 September 1842, Joseph exulted at hearing “Glad tidings from Cumorah! Moroni, An Angel from heaven, declaring the fulfilment of the prophets.” “Letter to ‘The Church of Jesus Christ of Latter Day Saints,’ 6 September 1842 [D&C 128],” p. 7. It’s conceivable that Joseph eventually accepted the identity of the hill Cumorah as being the hill in Palmyra after this theory became popular amongst early Church members. Be that as it may, it would still appear that, as with Oliver, Joseph Smith’s views on Book of Mormon geography were the product of his being informed by popular nineteenth century Mormon speculation, not revelation. See Matthew Roper, “Limited Geography and the Book of Mormon: Historical Antecedents and Early Interpretations,” FARMS Review 16, no. 2 (2004): 225–275; “Joseph Smith, Revelation, and Book of Mormon Geography,” FARMS Review 22, no. 2 (2010): 15–85; Matthew Roper, Paul J. Fields, and Atul Nepal, “Joseph Smith, the Times and Seasons, and Central American Ruins,” Journal of the Book of Mormon and Other Restoration Scripture 22, no. 2 (2013): 84–97; Neal Rappleye, “‘War of Words and Tumult of Opinions’: The Battle for Joseph Smith’s Words in Book of Mormon Geography,” Interpreter: A Journal of Mormon Scripture 11 (2014): 37–95; Matthew Roper, “John Bernhisel’s Gift to a Prophet: Incidents of Travel in Central America and the Book of Mormon,” Interpreter: A Journal of Mormon Scripture 16 (2015): 207–253; Mark Alan Wright, “Joseph Smith and Native American Artifacts,” in Approaching Antiquity: Joseph and the Ancient World, edited by Lincoln H. Blumell, Matthew J. Grey, and Andrew H. Hedges (Salt Lake City and Provo, UT: Deseret Book and Religious Studies Center, Brigham Young University, 2015), 119–140; Matthew Roper, “Joseph Smith, Central American Ruins, and the Book of Mormon,” in Approaching Antiquity, 141–162.